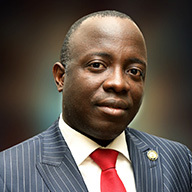 The Honourable Commissioner, Ministry of Finance/ Economic Planning and Budget, Ashade Akinyemi Jeremiah was until his appointment by Governor Akinwunmi Ambode, a Partner at KPMG Professional Services, one of the big four (4) international professional services firm with specialisation in audit, tax and advisory services. With over sixteen (16) years of professional experience with KPMG Nigeria and extensive skills in financial services industry, project and quality assurance management and public private partnership. A chartered accountant and fellow of the Institute of Chartered Accountants of Nigeria (ICAN), he graduated from the University of Lagos, with B.Sc (second class upper division) in Biology in 1997 and joined KPMG (then Arthur Andersen, Nigeria) in March, 1999. He was admitted as a partner in KPMG in 2013, and was appointed a Fellow, Institute of Chartered Accountants of Nigeria in 2015. At KPMG, he was part of teams of professional advisers who advised a number of Nigerian banks to raise capital and debts internationally through provision of comfort letters and other allied services. He has also been involved in the review of Public Private Partnership (PPP) models for funding infrastructure projects in Nigeria.